Following the positive reactions to new product launches from all four of its premier brands Selecon, Showline, Strand Lighting, and Vari-Lite, Philips Entertainment is celebrating its most successful Prolight + Sound Frankfurt to date. Following pl+s 2014, the new products made their UK show debut at Plasa Focus in Leeds. In Frankfurt Philips Vari-Lite's anticipated VL4000 Spot luminaire made its global debut, showing off its high lumen output, precision optics, and full feature set. "The VL4000 Spot represents the first in a new generation of Vari-Lite luminaires designed to provide designers, rental companies, venues and productions with luminaires offering unlimited possibilities without compromises," said Brad Schiller, Vari-Lite Product Segment Manager. "The launch at Prolight + Sound with multiple light shows and continuous amazing looks showed the industry many of the capabilities that make the VL4000 Spot the new choice luminaire for productions and rental companies around the world." Philips Showline premiered the SL NITRO 510C, demoing the unit's full RGBW capabilities within the same compact fixture as the SL NITRO 510 while maintaining similar output, multiple zone control and continuous-on abilities. Showline also debuted the SL Wash 350, which delivers a bright homogenous beam with a large zoom range. The luminaire's 19 RGBW 15-watt LEDs deliver over 5,800 lumens of output and abroad colour palette. In addition, the company unveiled the SL eSTROBE 130 and SL ePAR 180 luminaires. Strand Lighting launched 'a new chapter in the evolution of control' in its 100th year in the form of the NEO expandable control system. The sleek and modern NEO is designed to make a strong statement of Strand Lighting's commitment to creating forward-thinking, powerful consoles catering for the needs of the most demanding lighting design projects. 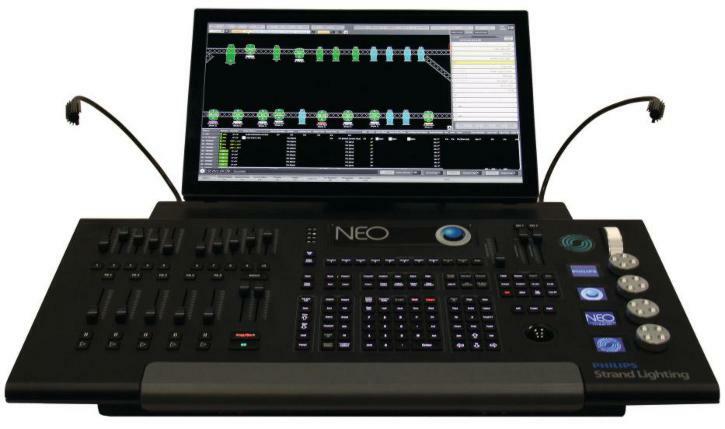 "Interest in the Strand Lighting NEO control was immediate and constant throughout Prolight + Sound, demoing the NEO's ability to seize the light, to grab, move, change, position, colour and motivate your lighting design simply and effectively," says Pete Borchetta, Philips Entertainment Product Marketing Manager. "NEO is the closest that a designer can get to actually touching the light, and heralds a new era for Strand Lighting as the company celebrates its 100th anniversary of lighting control." Philips Selecon premiered the LED RAMA Fresnel which provides an adjustable cone of light, a soft edge, and is easily blended with adjacent beams for even illumination. The LED RAMA's features include DMX 512A (RDM) input/output with 8 or 16 bit resolution, quiet active cooling system, onboard LCD menu, and a smooth 'posi-slide' focus system. The luminaire is constructed from aluminium extrusion and moulded engineering plastics, tilt and focus scales are in real degrees allowing for accurate WYSIWYG implementation. © 2000 © 2014 Pro-Light-News™. All rights reserved. Thank you for visiting Pro-Light-News™.